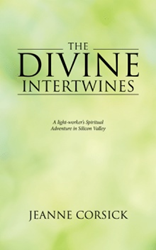 “The Divine Intertwines: A light-worker's Spiritual Adventure in Silicon Valley” (published by Balboa Press) shares Jeanne Corsick’s story of how through determination to work on a relationship with herself first, enabled her to enjoy successes that followed. Jeanne Corsick is a first time author with an extensive background in the role of executive assistant and project-program manager. She has worked in various industries in Silicon Valley that include semiconductor, software, bio-technology, email security, cloud computing, and digital marketing, specifically search engine optimization.